Last Thursday, the Census Bureau released its annual report on state government tax collections, showing that state government revenues from taxes increased 6.1 percent between 2012 and 2013. This marks the third consecutive year that collections have increased since the recession – for a total 18.6 percent increase in nominal terms since 2009. 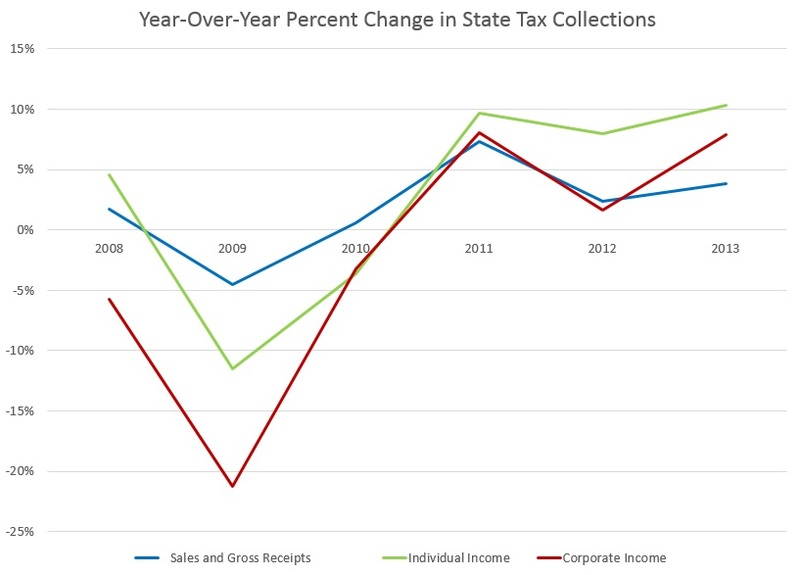 Despite claims of state revenue shortages since the recession, steadily increasing revenues have nearly pushed total state collections back to pre-recession levels. After adjusting for inflation, the difference between collections at the peak of the bubble and current collections is only about 2 percent. The Census survey classifies collections using five broad categories, which can be seen in the figure below. Revenue from sales taxes and gross receipts taxes make up over 46 percent of the total tax base at $309 billion, followed by income taxes with nearly 42 percent. 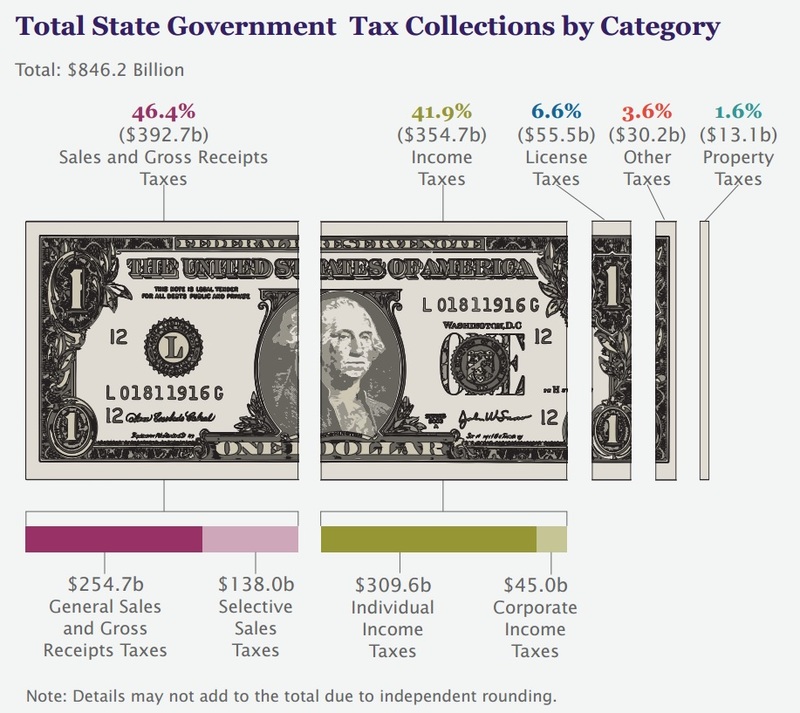 License, property, and other taxes account for the final 11.8 percent of total collections. While property taxes are typically levied by local governments (and you can find Census data on local tax collections here), 36 states levy some sort of statewide property tax, which make up 1.6 percent of total collections. 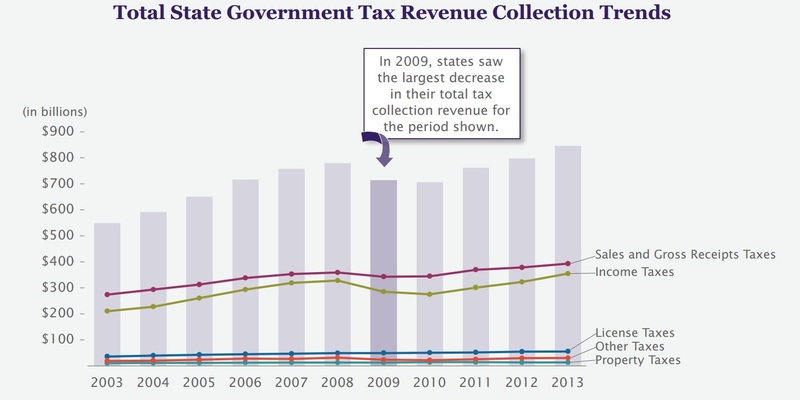 While total state revenues dropped in 2009, collections from property and license taxes increased by 2.5 percent and 0.16 percent respectively. "Other" taxes increased by 24.6 percent. 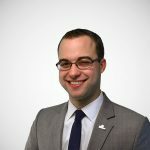 However, because these three tax categories only make up about 10 percent of total state collections, their stability has little impact on the stability of total tax revenues for states. The sales tax is typically more insulated from fluctuations in the economy. Since 2007, the standard deviation of year-to-year percent change for income taxes was 8.9 percent compared to sales taxes at only 3.8 percent. This relative stability was confirmed during the recession: between 2008 and 2009, sales tax collections only decreased 4.5 percent, compared to an 11.5 percent drop in revenues from individual income taxes and a 21.2 percent drop in revenue from corporate income taxes. See more of our work on post-recession collections here.